Popo and Nana are the Ice Climbers. Together, they climb to the summits of the world's most dangerous mountains. Along the way, Topis, Nitpickers and Polar Bears will try to stop them from reaching the peak. Once there, they can grab the vegetables and the Condor to truly conquer the mountain. Popo can either climb the mountain alone, or a second player can join in and help with Nana. The hero of Ice Climber. Popo is a mountain climber wearing a blue parka and carrying a large ice mallet. He can jump up to break the ice above him and jump up through the gap to scale each mountain. In the 2 Player Game, the second player controls Nana in the pink parka. The two Ice Climbers can work together to beat enemies or clear a path, but only one of them can enter the Bonus Stage and grab the Condor. A creature that lives on the mountains, working tirelessly to plug any holes created by the Ice Climbers. When Topi finds a hole it will dash to its cave and return with a block of ice to fill it. It	appears	as a seal in the Japanese version and a fuzzy yeti in other versions. A pink bird that flies around near Popo and Nana, getting in the way. If it flies into the Ice Climbers, they will lose a life. Jump up and hit it with the mallet to take it out and receive bonus points. If you spend too long on one level, the Polar Bear appears. It causes an earthquake by jumping, pushing the whole stage downwards by one level. If you are on the bottom level, you will fall off the bottom of the screen. 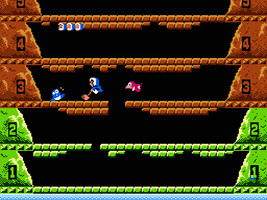 On certain levels, icicles form underneath platforms, break off and drop down onto the Ice Climbers. Avoid it or jump up and hit it with a mallet. The Condor flies around at the very top of the mountain, where it has hidden all of the Vegetables. Popo or Nana has to grab its feet to clear each stage. These delicious Vegetables were stolen by the Condor and appear in the Bonus Stage. Grab as many as you can for bonus points. For each stage you clear, a different vegetable will appear.